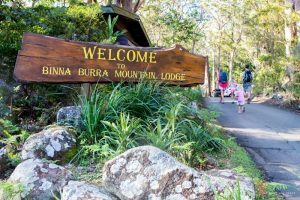 Part of the Gold Coast Hinterland Great Walk, a multi-day hike, the section from Binna Burra to O’Reilly’s Rainforest Retreat in the Green Mountains section of Lamington National Park makes a good full-day walk. From Wanungara Lookout views extend over Limpwood Valley, Mount Warning and sometimes as far south as Byron Bay. 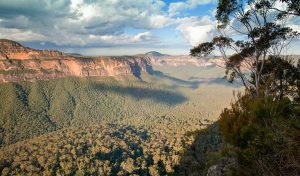 Deep chasms and towering waterfalls reward walkers who make the effort to explore the Blue Mountains National Park. The sandstone cliffs create a dramatic backdrop to this walk, which leaves from the visitor centre. At the 1.8 km mark, Govetts Leap Lookout provides a prime lunch spot with breathtaking scenery. There is a steep descent into a gorge to access Grand Canyon. 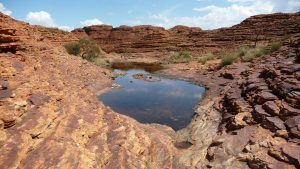 Turn right at Greaves Creek and follow the canyon, as the sandstone walls become deeper and closer, crossing the creek multiple times. After about 500 m, well-formed steps lead out and towards a 10 m tunnel. Discover Australia’s wild beauty on the Twelve Apostles Lodge Walk. 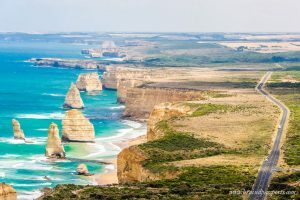 The walk traverses the length of the Shipwreck Coast and Great Ocean Road, along the spectacular coastline between Apollo Bay and the iconic Twelve Apostles. Delight in the variety of landscapes from cool-climate rainforest and remote beaches to coastal cliff tops, and finally view it all from the air on a Twelve Apostles scenic helicopter flight. The trail is alive with native wildlife: fur seals, wallabies, koalas, and plants unique to this special corner of the world. Each night you’ll return to the comfort of a luxury eco villa, with hot showers, private bathrooms and foot spas and dine on fabulous chef prepared regional food and wines. 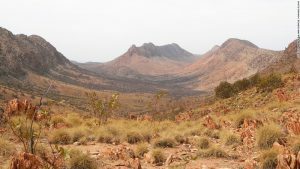 Kings Canyon is the main draw card for visitors to Watarrka National Park. Featuring 100 m ancient sandstone cliffs and lush pockets of vegetation that contrast to the arid desert surrounding them, the best way to enjoy the spectacle is on the Canyon Walk. The track starts with a challenging, steep climb to the ridge, then follows the rim before descending back to the car park. About halfway along, hikers are offered reprieve at the Garden of Eden where waterholes, green plants and cool shade dots the ridge. Walk in a clockwise direction and be careful walking in the hotter months between September and May. 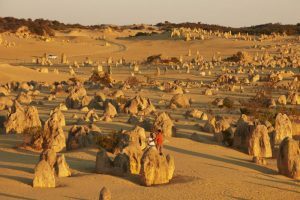 Thousands of limestone pinnacles, some as tall as 3.5 m, rise from the desert sands and are the major attraction of the Nambung National Park. As well as the walk, there are multiple viewing decks which can be accessed by car, and allow even non-walking visitors to fully appreciate these natural wonders. From the interpretive centre, walk along the road to the easy before turning left at a fork to enjoy a fantastic vista at the viewing deck 1.3 km in. Along North Spur is a collection of pinnacles called the Milk Bottles, which shouldn’t be missed. A further 700 m on is the tallest pinnacle. 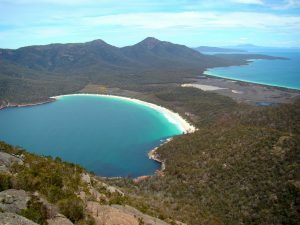 Wineglass Bay regularly sits atop the most beautiful beaches list of travel magazines and websites worldwide. Viewing the beach from the lookout marks the start of this walk and many visitors never venture further than the lookout, but those who leave the crowds behind will be rewarded with one of Australia’s finest coastal walks. Enjoy the white beach, the crystal clear waters, a walk through the low marshy isthmus, a dune-locked lagoon system, and the unique bare granite outcrops of the Hazards. Remember, keep your eyes out the local dolphin population and migrating whales. Follow Fourth Creek to the heart of Morialta Gorge, on the valley floor along a stroller accessible trail. During summer the creek is dry. 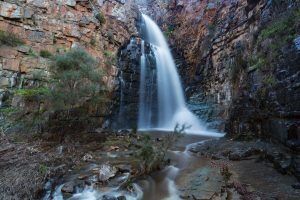 After autumn and winter rains, water tumbles thirty metres from the top of Morialta’s best known landmark, First Falls. The hike begins from the top carpark, or you can commence from the lower carpark on Stradbroke Road. 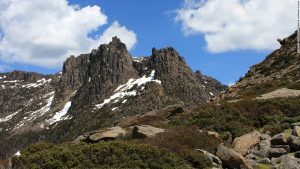 Highlights include Marion’s Lookout with (if the weather’s good) great views of Cradle Mountain; Barn Bluff towering over an exposed alpine plateau; and the beautiful D’Alton and Ferguson Falls. Worth the challenge, weather permitting, is the five-hour side trip climbing Mount Ossa. The guide points out two rocky towers, nicknamed The Gates of Mordor, after that dire place in “The Lord of the Rings.” And up we go. Michele Eckersley of World Expeditions (WE) says: “It’s our No. 1 trek worldwide.” Apart from the six-day classic experience — support vehicles reduce the total walk — there’s also a 14-day end-to-end option (the whole 223 kilometers). 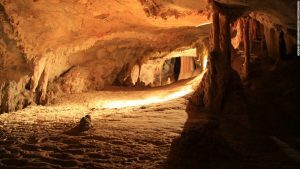 Taking three days and two nights, the 44-kilometer track starts at the Explorers’ Tree, drops into Megalong Valley and crosses Coxs River by the Bowtells Swing Suspension Bridge. Challenging climbs take walkers to the Black Range ridge before heading for the caves. 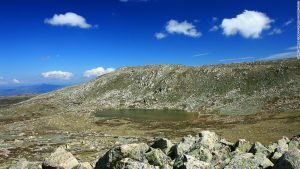 From the Kosciuszko Express chairlift at Thredbo in the summer, a 14-kilometer return walk (five hours) goes to the summit of Mount Kosciuszko — at 2,228 meters, Australia’s highest peak. Passing the sign at Rawson Pass, it’s not much further before there’s a carnival atmosphere among hikers who have made it to the top of Australia. The route’s easy to do independently but guided walks are an option. A favorite is Manly to the Spit Bridge, a 10-kilometer one-way walk of three hours. No human guide is needed — Manly Guide has an excellent map. The Murray River Walk, by Luxury River Trails, starts in Renmark and explores the beautiful Murray River in the internationally recognised Riverland Ramsar Wetland. 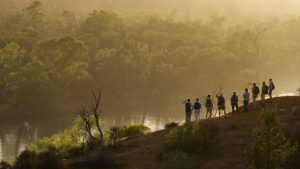 The easy to moderate, 40 kilometre (25 mile), four-day, three-night walk operates between April and October and showcases the bush trails, ancient red gum forests, wetlands and red ochre cliffs lining the banks of Australia’s most famous river. 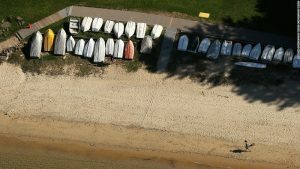 You’ll discover diverse wildlife and waterbirds along the river, creeks and old oxbow lagoons and learn about the river’s rich heritage, including Aboriginal culture, pastoralism, paddle-steamers, locks, irrigation issues and environmental stewardship. The daily walking routes are on private property and in conservancy areas with exclusive access for Murray River Walk guests only. Each night you stay in private ensuite accommodation on a modern 10-berth houseboat with a deck spa overlooking the river. Gourmet dinners showcase the food and wine of the Riverland food bowl and you enjoy a final lunch at the award winning Wilkadene Woolshed Brewery.